Fall has officially arrived and we are finally making delicious desserts with apples. 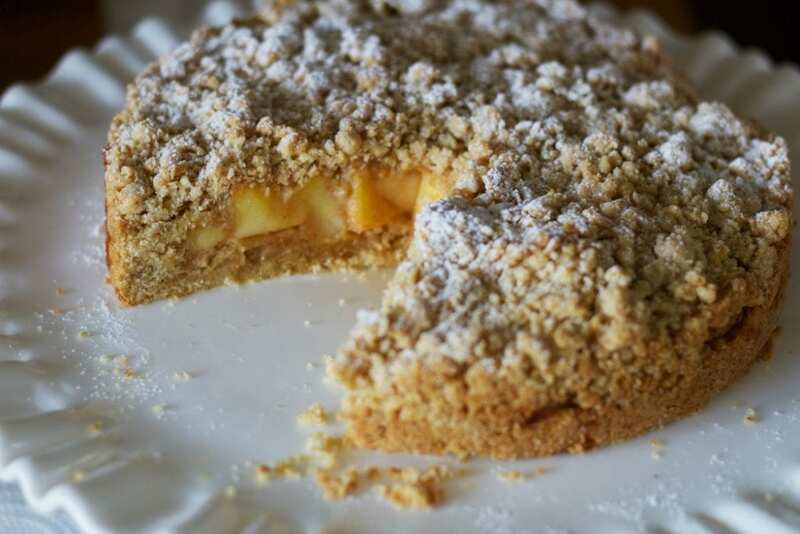 I couldn’t wait to make this Italian Apple Crumble Cake (Torta Sbriciolata alle Mele). 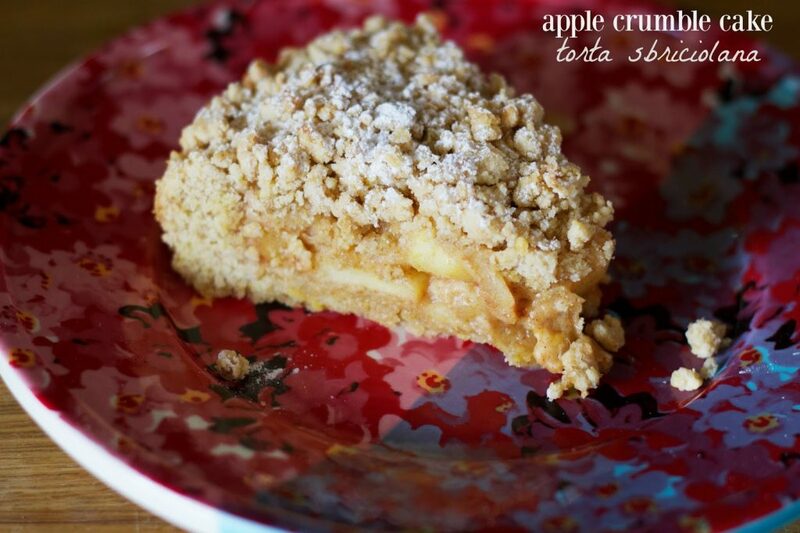 If you have been following my blog for a while, you know I just love baking with apples! This lovely cake is really easy to put together and is totally no-fuss! Sbrisolana is a cake you can find in Mantua in the Lombardy region of Italy. You may find the same cake in the Veneto region called rosegota and they also make a cake like this in the city of Verona and it’s very soft and has even more crumbs as it’s made without eggs. In the dialect of Lombady, sbrisolana means crunchy (it’s not really that crunchy when you take a bite) and it reminds me of a streusel topping I make for many of my quick breads and other desserts. Sbrisolana is dialect for sbriciolata. I love the name sbriciolata (pronounced: sbree-cho-LAH-ta). One of my favorite words is briciola, which means crumb. My mother-in-law lives in the Lombardy area near Como most of the year and she shared this recipe with us. 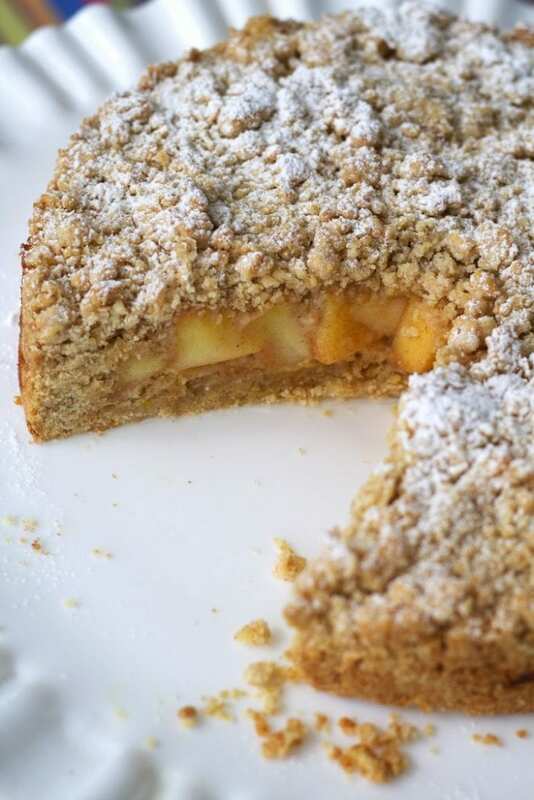 She usually makes this apple cake or even this one, but this crumble cake is also quite a hit! Like most of the cakes in Italy and that Teresa makes (my MIL), this is pretty simple and nothing fancy. There isn’t gobs of frosting and there aren’t a lot of steps to put it together, but it is delicious!! Have you been enjoying colder temps? So have we! It actually went down to the 60’s this past Sunday and we missed it. We went to beautiful Boston to see some dear friends and to eat! Boston is one of my favorite places. There are so many cool and hip restaurants. We walked by an Italian restaurant called Sportello that is just beautiful and had desserts at Pastoral (and even a pretty amazing pizza Margherita). The concierge recommended Lucky’s Lounge near our hotel for burgers and it was a great recommendation. Lucky’s Lounge used to be a speak easy and has a super cool vibe, great service and food. We tried to get into Shojo noodles in Chinatown for some ramen. I read online a really great review, but when we got there the hostess said there was a 1.5 hour wait (on a weeknight, no less). The music was super loud and it was filled mostly with high bar tables (not a kid friendly place). We ended up eating at a much smaller place that was super quirky with Asian music videos playing on a big screen TV when you walk in. They had great appetizers and even delicious sushi. 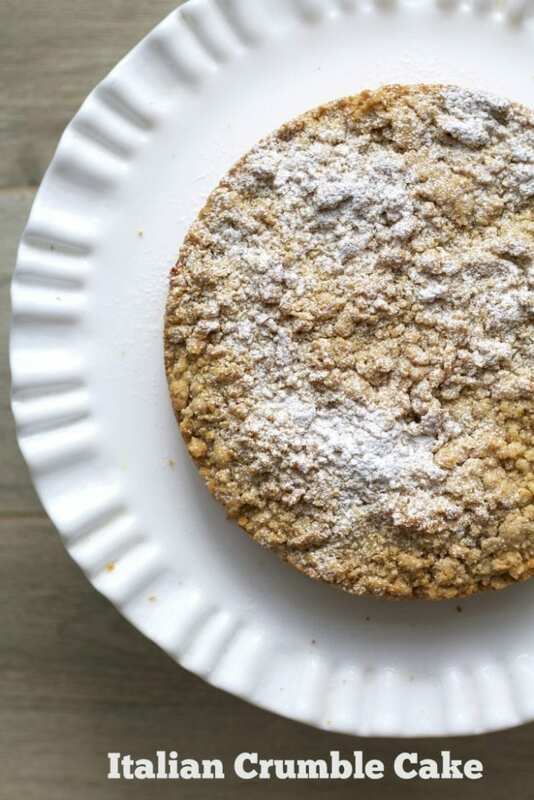 This isn’t what you expect when you make a typical American crumb cake. The bottom of the cake is also a layer of crumbly dough as opposed to a more fluffy cake or really soft quick bread you will find in an American recipe. And since it’s made with sweet fall apples, this could be the most perfect dessert to serve at Thanksgiving or mix it up with another fruit filling. I used Granny Smith apples, but you could experiment with different apples or a combination to get a different texture and sweetness. 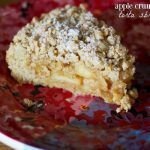 A delicious Italian apple crumble cake that is perfect to enjoy for breakfast or an afternoon break with a hot cup of coffee. Place the flour and baking powder in the bowl of a food processor and pulse a few times to combine. Add the lemon rind, granulated sugar and salt and pulse again. Add the cold butter pieces and pulse until you get a sandy texture (about 6-8 pulses. Be sure the butter is broken up in the flour and there are no large chunks. Transfer the flour mixture to a clean counter (or a bowl)and incorporate the eggs gently with your hands to get large crumbs. The dough should stay more crumbly than combined. Refrigerate the dough for about 30 minutes. While dough chills, heat the oven to 350 F. Line a 9-inch spring form pan or round cake pan with parchment paper. I sprayed my paper and pan all around with non-stick baking spray. Prep apples also while dough is chilling. In a small skillet, add in the apples, 2 Tablespoons sugar, lemon juice, apricot jam and cinnamon. Cook on medium-low heat for about 8-10 minutes until the apples are tender (it took my apples 10 minutes to have the right consistency after baking). Remove from the heat and set aside while you finish prepping the dough in the cake pan. Once dough is chilled, place ¾ of your crumbly dough on the bottom of the pan and with a spoon, press it and push some up the sides of the pan. Place the apples on top of the crust. Sprinkle on the rest of the crumbly dough on top of the apples making sure to get the corners and covering the apples. Press gently to make sure the crumbs stick together taking care that they are still crumbly. Bake for about 35-40 minutes or until light golden brown. Let cool completely in pan. Remove when ready to serve and dust lightly with confectioner's sugar. That is so pretty and it looks delicious. This is gorgeous and I wish I knew how to pronounce the Italian name! I'm in love with that crumb topping — looks delicious! Your apple cake looks absolutely scrumptious! I don't love baking, but maybe I can get one of the other bakers in our house to make this for me! Obsessed with this torta! I have so many apples I could use!